Aeromotive 10 Micron Fuel Filter Element, FE-12601 - Free Shipping For Online Orders Over $25! 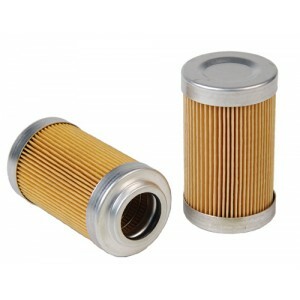 Commonly the most overlooked component in a fuel system, filter neglect can be the most costly. If not cleaned or replaced regularly, filter elements can become clogged resulting in reduced fuel flow, engine performance and ultimately, fuel pump or even worse, engine damage. By simply replacing and/or cleaning your filter elements regularly, you can avoid costly repairs to your fuel system and ensure peak engine performance. Aeromotive recommends annual inspection and service of filter elements. This includes replacing 10-micron fabric elements and cleaning or replacing 100-micron stainless steel elements. Severe duty applications or newly installed systems may require more frequent maintenance. -10 Micron element -Element fits FF-12301, FF-12321, 12306 & 12351 Commonly the most overlooked component in a fuel system, filter neglect can be the most costly. If not cleaned or replaced regularly, filter elements can become clogged resulting in reduced fuel flow, engine performance and ultimately, fuel pump or even worse, engine damage. By simply replacing and/or cleaning your filter elements regularly, you can avoid costly repairs to your fuel system and ensure peak engine performance. Aeromotive recommends annual inspection and service of filter elements. This includes replacing 10-micron fabric elements and cleaning or replacing 100-micron stainless steel elements. Severe duty applications or newly installed systems may require more frequent maintenance.